Cities Connection Project | KINDERGARTEN. CARONA. VOLPATOHATZ was invited to join a competition to de- sign a new kindergarten for the small town of Carona just 15 minutes from centre of Lugano. 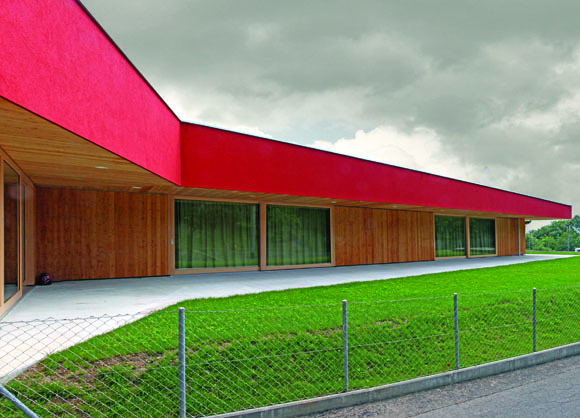 The prerequisite for this kindergarten of 25 children was to enable speedy construction with the use of pre- fabricated elements for the entire building all to a Swiss Minergie standards. 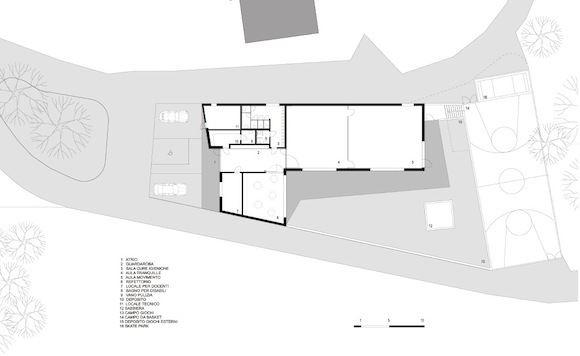 VOLPATOHATZ won the competition with a proposal for an all-compact building on one floor that could easily be transformed from a kindergarten to a multifunction Community hall. Large openings were placed towards the south with a continuous roof overhang that allows winter light to warm the two classrooms and refectory but also provide a covered area for children when it rains. A helicopter was used to install all prefabricated timber elements into position shortening the construction time from excavation to final completion in only 5 months. The building complies with strict Swiss Minergie stan- dards all-inclusive in the low cubic construction cost of CHF 900.